Martha (right), the last known passenger pigeon, died in 1914. Her preserved body is now on display at the Smithsonian's National Museum of Natural History in Washington, D.C. 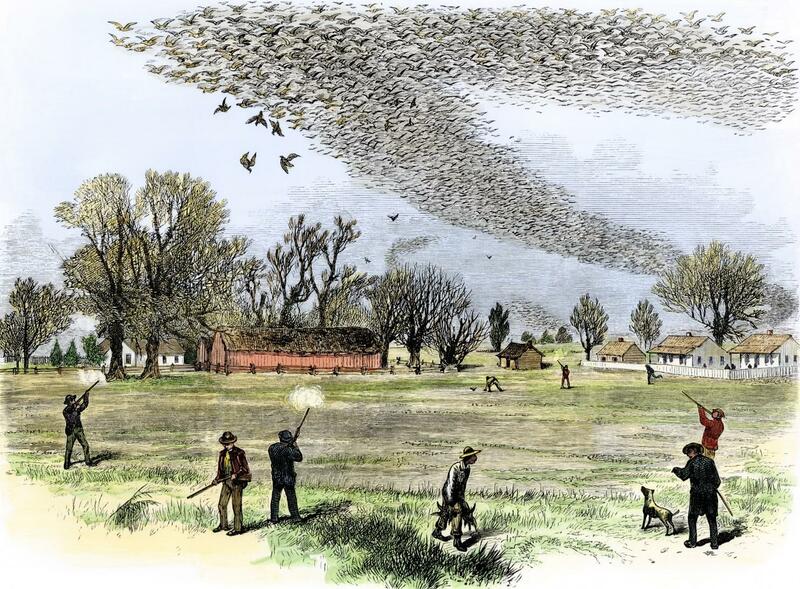 The artwork titled Shooting Wild Pigeons in Northern Louisiana is based on a sketch by Smith Bennett and appeared in the Illustrated Sporting and Dramatic News of July 3, 1875. Scientists believe they may have new insights into why passenger pigeons went extinct, after analyzing DNA from the toes of birds that have been carefully preserved in museums for over a century. "We were hoping that we could get to the bottom of why they went extinct so quickly — why it was that this giant population of birds suddenly became extinct, entirely extinct, over the course of just a couple of decades," explains Beth Shapiro of the University of California, Santa Cruz, one of the researchers on a newly released study in the journal Science. Billions of passenger pigeons once flew over North America, flocking together in huge clouds of birds. "There are crazy historic records about this thing blocking out the daytime sky for hours at a time," Shapiro says. These awesome congregations also made the birds easy to hunt, and their numbers started to decline rapidly in the late 19th century. The last known passenger pigeon, Martha, lived at the Cincinnati Zoo until her death in 1914. Her body got frozen inside a 300-pound block of ice and shipped by train to the Smithsonian in Washington, D.C., where tourists can see her stuffed body on display in a glass case. "Why did little tiny populations of this bird not somehow survive in some refugial forest somewhere?" Shapiro says. "Why did they just go from billions to none?" Museums have many other passenger pigeons besides Martha in their collections, and the researchers recently persuaded curators to let them take tissue samples from scores of the birds. All the team needed was a tiny piece of skin from the bottom of one of the pigeon's toes. "And from that," Shapiro says, "we were able to generate the entire genome sequence from several of these different birds." They compared the passenger pigeons' DNA to that of its closest living relatives, band-tailed pigeons, which live across the west coast of North America. Band-tailed pigeons are very similar to passenger pigeons, except they don't live in groups of billions. "The only difference between them is really this population size, so we can start to dig into what the evolutionary consequences of being a super-big population might be," Shapiro says. A genetic study done a several years ago suggested that passenger pigeons were not always super-abundant, but might have had dramatic fluctuations in population size that could have increased their vulnerability to extinction from hunting. But this new analysis suggests that's not the case. "We find evidence that the passenger pigeon population size was actually large and it was stable for a really long time before hunting started in the 19th century," says Gemma Murray, one of the researchers from the University of California, Santa Cruz. There's also evidence that passenger pigeons had a high rate of adaptive evolution, suggesting that they adapted to living in a large population. "It's known that they collaborated in finding food, and they also collaborated in rearing young," Murray says. "And so these sorts of behaviors are the sorts of things which might work really well when your population size is large and dense. But when hunting had a big impact on their population, and their numbers went down hugely in the 19th century, maybe those things didn't work anymore." The bottom line, according to Shapiro, is that "passenger pigeon extinction was avoidable. It was entirely our fault. We over-hunted and over-exploited this amazing animal, and we should try to be careful about what we're doing today." Eric Routman, a researcher at San Francisco State University who studies the genetic aspects of evolution but was not involved in the study, says the findings are "hugely interesting in terms of the relationship between the size of the population and the amount of genetic diversity." But, he adds, "I don't really think it helps us very much in explaining why they went extinct." That view was echoed by Bob Zink, a scientist at the University of Nebraska-Lincoln who worked on the earlier study suggesting passenger pigeon populations had fluctuated wildly in the past. "I'm not sure that either one of our papers provides any genetic insights into why they went extinct," he says. To him, the birds appear to be a victim both of humans and their own biology. "We reduced the population to a point where their own biology was unable to succeed," Zink says. Helen James, curator of birds at the National Museum of Natural History at the Smithsonian, says she is "extremely impressed with the amount of data that we can now get from these little toepads, from these old specimens of extinct birds. We can learn things that we just never imagined, 10 years ago, that we would be able to learn about the history of these birds." She notes that a lot of conservation efforts focus on small, rare populations, and that this might be a real oversight. "We have to understand what's going on in populations, what's going on in the ecosystem at large," James says. "Because if a major factor that allows the species to survive suddenly changes, you absolutely can have sudden disappearances of species that are ecologically playing a really large role. And that can have cascading effects." The skies over North America were once filled with passenger pigeons. In the 19th century, birdwatchers described clouds of pigeons so big they blocked the sun. About a hundred years ago, the species went extinct. NPR's Nell Greenfieldboyce reports that scientists have been trying to learn more about how the species got killed off by looking at the birds' DNA. NELL GREENFIELDBOYCE, BYLINE: Passenger pigeons are still around. They're just dead, like Martha. She's perched on a branch in a glass box at the Smithsonian's National Museum of Natural History. Compared to a modern city pigeon, Martha looks thin and delicate. HELEN JAMES: She's somber looking. She's not very brightly colored. She has a long, tapering tale, more like a mourning dove. GREENFIELDBOYCE: Helen James is the curator for birds here. She says Martha lived at the Cincinnati Zoo and was believed to be the last remaining member of her species until September 1, 1914, when she was found lifeless at the bottom of her cage. JAMES: It was really a wake-up call. It had been the most abundant species of bird in North America. GREENFIELDBOYCE: And yet hunting and a changing landscape wiped it out in just a few decades. That fascinates Beth Shapiro at the University of California, Santa Cruz. BETH SHAPIRO: Why did little, tiny populations of this bird not somehow survive in some refugial forest somewhere? Why did they just go from billions to none? 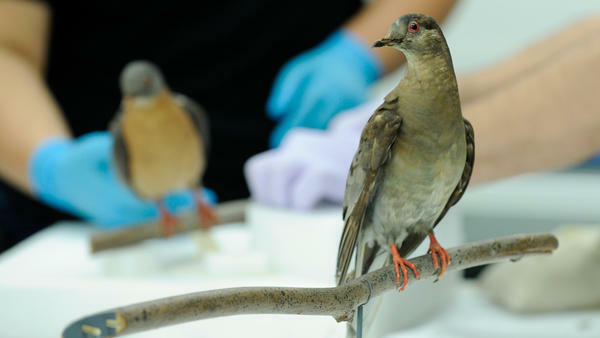 GREENFIELDBOYCE: To try to find out, she and some colleagues have been extracting DNA from scores of passenger pigeons preserved in museum collections. SHAPIRO: Curators were kind enough to let us chop off a tiny little piece of skin from the bottom of one the toes, a little toe pad. GREENFIELDBOYCE: They were able to get the entire DNA sequence from several of these birds and compare it to the DNA of their closest living relative, the band-tailed pigeon. Now, a few years ago, there was a previous genetic study. It suggested that the passenger pigeons' population size might have fluctuated wildly through history, possibly making them especially vulnerable to extinction. This new study didn't find that. Instead, it suggests an enormous, stable population that existed for a really long time, meaning that these birds likely evolved to depend on each other. Gemma Murray is one of the researchers at the University of California, Santa Cruz. GEMMA MURRAY: So it's known that they collaborated in finding food, and they also collaborated in rearing young. GREENFIELDBOYCE: When their numbers plummeted in the 19th century, the big flocks they'd always known were suddenly gone. MURRAY: They weren't well-suited to then - trying to live in smaller and most disparate populations. GREENFIELDBOYCE: The work appears in the journal Science, and it impressed Helen James, the curator at the Smithsonian. JAMES: Well, I think it's hyper-cool. GREENFIELDBOYCE: She shows me a tray filled with more than a dozen passenger pigeons laid out in rows. JAMES: You know, we can learn things that we just never imagined 10 years ago that we would be able to learn about the history of these birds. GREENFIELDBOYCE: To her, these birds are a reminder that even though conservation efforts often focus on small groups of rare animals, something really common can be at risk, too. Nell Greenfieldboyce, NPR News. (SOUNDBITE OF GLOBULDUB'S "FOREIGN EXCHANGE") Transcript provided by NPR, Copyright NPR.